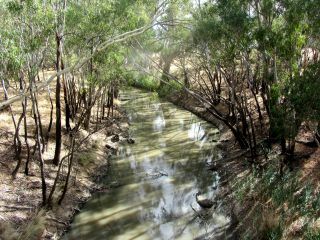 Environmental watering provided relief to the Loddon River during a dry 2015–16. Like the Campaspe River, the Loddon is on the road to recovery following the prolonged drought and the floods of 2011. Environmental watering is important for this recovery, maintaining habitat for fish, waterbugs, platypus and water rats and helping to re-establish in-stream and fringing plants. "Monitoring results show an increase in the distribution and number of Murray rainbowfish over the past four years, which is a promising result," said North Central Catchment Management Authority's (CMA) Phil Slessar. "River red gums are also showing signs of improved health and in-stream vegetation continues to recover." Healthy plants provide important habitat for native fish and the waterbugs that fish, waterbirds, water rats and platypus feed on. A survey of Lake Meran also identified that hatchlings and juvenile Murray River turtles are in greater numbers than adult turtles, indicating successful breeding. "This is a significant finding as exotic predators like foxes that prey on turtle eggs have significantly reduced the successful breeding of all freshwater turtle species, with adults recorded in greater numbers than juveniles throughout much of the Murray-Darling Basin," Phil said. "Therefore, the population of Murray River turtles at Lake Meran could be regionally significant if young turtles can recolonise the rest of the Loddon system during times of flood." "A healthy river delivers benefits to the environment, the local community and the economy," Phil said. Recreational fishing is popular in the upper Loddon River and Serpentine Creek. Laanecoorie Reservoir is inhabited by Murray cod and golden perch, and Serpentine Creek has annual sightings of golden perch. Other recreational activities around the Loddon include waterskiing, boating, swimming, canoeing and walking along riverside tracks. Environmental watering also improves water quality including water then used for irrigation.